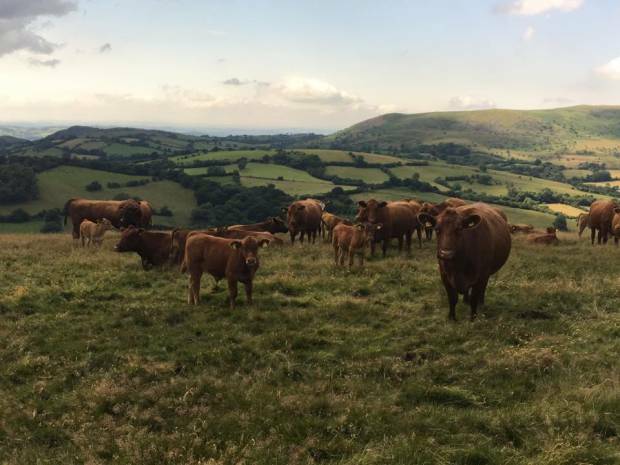 James Evans’ Partridge Farm situated in Linley, near Bishops Castle spans just over 800 hectares (2,000 acres) and is home to his 300 Stabiliser suckler cows and 1,000 Lleyn ewes. The sucklers are split into two units, a 180-cow spring-calving herd (Partridge Farm) and a 120-cow autumn-calving herd (Walcot Farm) both producing quality maternal high health status breeding stock and bulls finished in a semi intensive system. In 2007, James who farms in partnership with his brother Rob and father John, converted from traditional dairy cross sucklers to an all Stabiliser performance recorded herd, completely overhauling his beef enterprise. Performance recording was a key player in the decision to transfer to the breed. James believes strongly that beef producers should make use Estimated Breeding Values (EBVs), allowing them to identify animals that are truly genetically superior rather than relying on aesthetics which are often not directly correlated to performance.